Primo Levi, a Holocaust survivor and testimonial writer, found it urgent to raise awareness of the horrors he had witnessed. It pained him to hear of holocaust revisionists and deniers. If we forget about the lessons of history, the unthinkable can happen again. If we forget about tyrants such as Hitler and Stalin, if we start with a tabula rasa, their crimes will be repeated. Our times are particularly perilous in that we are undergoing socio-economic circumstances similar to the 1920s. Whilst Western Europe will not have a repeat of these horrors - the lessons of the Holocaust are deeply entrenched - Eastern Europe is taking a scary turn in that direction. With high unemployment, extreme ideologies seem to people to be the ideal solvent to their ills. The third biggest political party in Hungary stated that all the Jews in Hungary must be counted. The Golden Dawn in Greece is also terrorising racial minorities and capturing the imagination of younger voters. 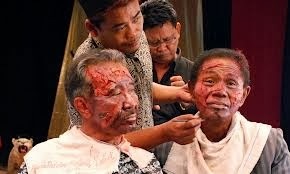 In a recent documentary about the Indonesian genocide of 1965, The Act of Killing, we see the perpetrators several years hence. 500,000 people were killed within three days. The Western media portrayed the killings as a decisive victory over communism during the cold war. The gang members who carried out the crimes now live with equanimity. When asked about their crimes, they seem vindictive. In one startling scene, when asked if the communists might want revenge, one member replies along the lines of 'Well, we will just crush their skulls and they will be quiet.' The whole room lights up, the chat show host smirks and everyone claps with fervor. What is interesting about this scene - and representative of these apologists - is that communists are not vilified for their political beliefs. They are vilified for being 'the other,' 'the parasite,' 'the enemy.' The annihilation of this tribe or ethnic group guarantees the realisation of a political agenda. In the case of Nazi Germany, the annihilation of the Jews would create an 'Aryan' society and a Superman. In the case of Indonesia and Chile, the annihilation of the 'communists' would segue way into a free market capitalist society. In the case of Chile, thousands of people were detained, tortured and killed. Of course, the right have ceaselessly tried to justify their actions. They even fabricated a story, which was believed for decades, called 'Plan Z.' 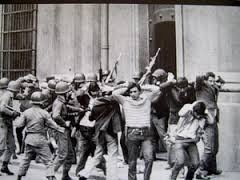 The right claimed that Allende planned self-coup to impose a marxist government. Such a plan never existed. This was a psychological game forged by the military to justify their crimes against humanity. What often happens is that the oppressors continue to prosper and the oppressed continue to suffer. In Chile, to be a 'Pinochetista' is completely uncontroversial. I know several people who have no qualms with being so. But, of course, if you support a cause, you support all the killings, tortures and crimes that cause entails. In effect, you are an apologist for genocide. These people are completely unrepentant and lead comfortable lives. The trial of Pinochet was interesting in that it was the first time a war criminal had been brought to trial by an international jury. Why should it solely be an internal affair? If international law were curtailed, it would set a precedent and many more criminals would be trialed. I have seen many comments stating 'Both Allende and Pinochet are a disgrace - let's forget about it and move on.' First of all, that is deeply disrepectful to the victims. Secondly - I'll drill in this point for the umpteenth time - history rarely repeats itself. This is because genocides are remembered. Germany is now a pluralist society, deeply mindful about its attitude. However grotesque the past may be, it must be remembered. The apologists who skew it must be brought to account.